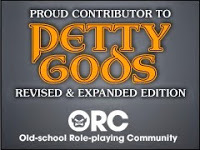 This week I'm dipping back into my DTRPG wishlist and pulling out an adventure that interested me last month when it first came onto the site. 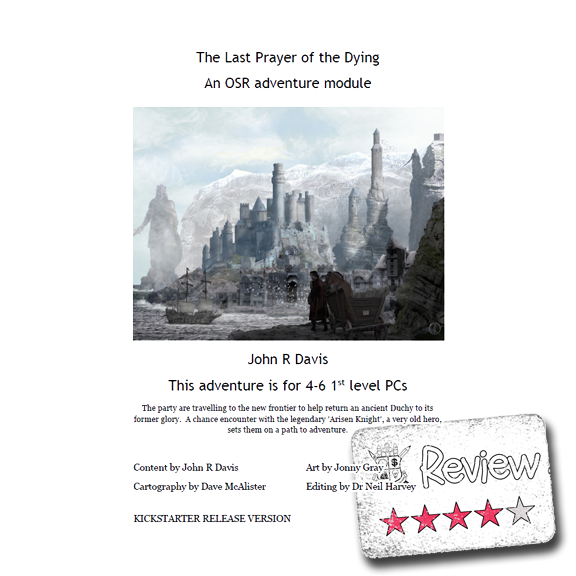 The Last Prayer of the Dying is the result of a roughly $1800 Kickstarter campaign. Figuring all the rewards were digital, that seems like a damned good haul on a KS campaign, but this isn't a post about Kickstarter.....but a bit of backstory. The important take-away is that this piece was originally written for D&D 5th Edition, but I'm going over the OSR version. This OSR version is a 6.15 MB PDF appropriately secured, but severely lacking it what should be required bells & whistles. At 89 pages in length you could easily argue that this mini-setting/adventure was fully intended to be used digitally and not printed out. Between the fact that everything was released digitally and there are an odd number of pages, I don't think that is too big of an assumption. Now I'm just personally annoyed...ok "annoyed" is way to strong a word....disappointed?....that the PDF description fields are left blank. I don't know...maybe I'm the only one who looks at those. At any rate, not having a single bookmark in the PDF is just unforgivable. At 89 pages I want, no...I need to be able to navigate through the document easily. There were the normal small oddities here & there in the PDF. Small stuff like the cover saying the adventure was for 4-6 1st PCs, but the Forward stating 5-8 1st level PCs. At one point there was a new item/material listed that had no explanation. A quick word search of the PDF only showed it mentioned as a one-off. That could be a bigger deal for some GMs, but I thought it was something I could figure something out on the fly. I think just having to look for more and coming up empty was more trouble than it was worth. The layout of the PDF was a straight-forward 2 column affair with art loosely interspersed throughout. I thought it odd that aside from the cover there was only one colored art piece. Nothing wrong, especially since those colors were quite muted...just an observance. I did note that the author intended to use italicized font to represent "read aloud" sections, but then pretty much immediately goes into using italicized font here and there for emphasis. Again, not that big of a deal, especially since the read aloud sections were clearly marked as "READ ALOUD", but these little internal inconsistencies really stick out to me. Now if I still have your attention as I've been pointing out all these "problems", let me get to the good stuff, starting where I left off with the layout. I loved the way encounters and monsters were written up. Things are broken down into distinct categories. I think in this case a picture is worth at least a hundred (or two) words. I like how these important details are separated from the body of the encounter text. Something tells me that this was created more for ease of use putting out different versions of the adventure for different systems, but I don't care, I like it. Speaking of different systems, there is a great bit of text in the Forward regarding the changes made to the adventure making it suitable for OSR. Knowing the considerations the author took into account tweaking the base adventure is a small bit of reassurance right up-front that this might be a good adventure. I really liked some of the small details introduced in the encounters. It didn't seem, at least to me, that there was too much of this to bog things down. Since this is essentially an introductory adventure, I'm glad it didn't feel like setting overload. Now this is the 1st adventure of what in intended to be a set of seven linked adventures. 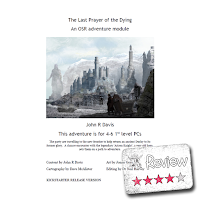 Because of this The Last Prayer of the Dying is also the beginning of a setting/campaign. As such I think the GM will probably want to wait to make sure some of the other adventures are ready (at the time of this review time they aren't), and I think that the GM will have to read & re-read the adventure several times because you'll need to get the details of the setting itself down. If you just extract the encounters and partial story arc to your own campaign...not so much. Now available as a PWYW add-on is the art pack containing all of the graphics used in the adventure PDF. The graphics are all over the place as far as size, which I found quite odd. I found files that were as large 1200 dpi and small as 150 dpi, but I didn't open every single file in the zipped art pack to check. Just if you need to use any of this for a VTT you'll probably need to re-size the files first. *The author seems to also be working on another adventure set, so I'd be concerned with starting an adventure "series" with a gaming group that only has the 1st adventure available.